As one of the world’s biggest beer producers, Spain has plenty to offer microbrewery fans. Valencia in particular is a place where local produce is a big deal, and people care about what goes into their food and drink – so it’s no surprise to find that the city is home to plenty of small breweries and craft beer bars that specialising in brews from both near and far. Here’s our pick of the best. 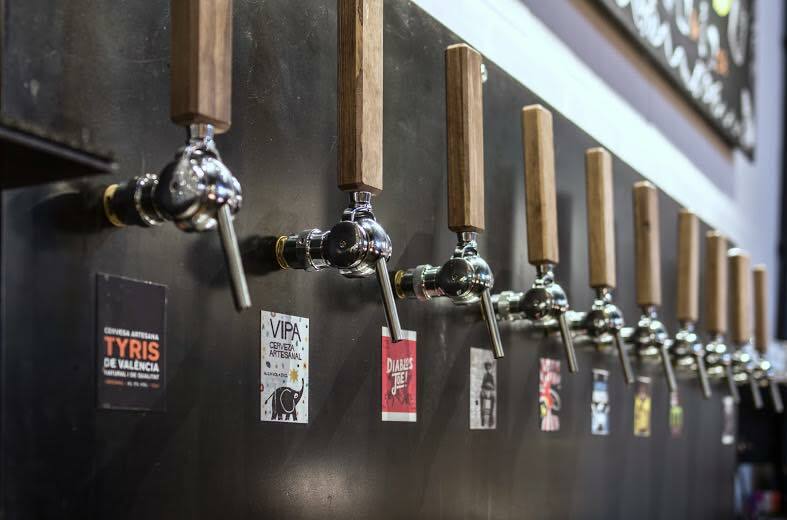 Possibly the most famous watering hole for craft beer lovers in Valencia, this official taproom for local brewers Tyris is located right in the city centre, near the central market, and has a great outdoor terrace hangout very popular in summer. 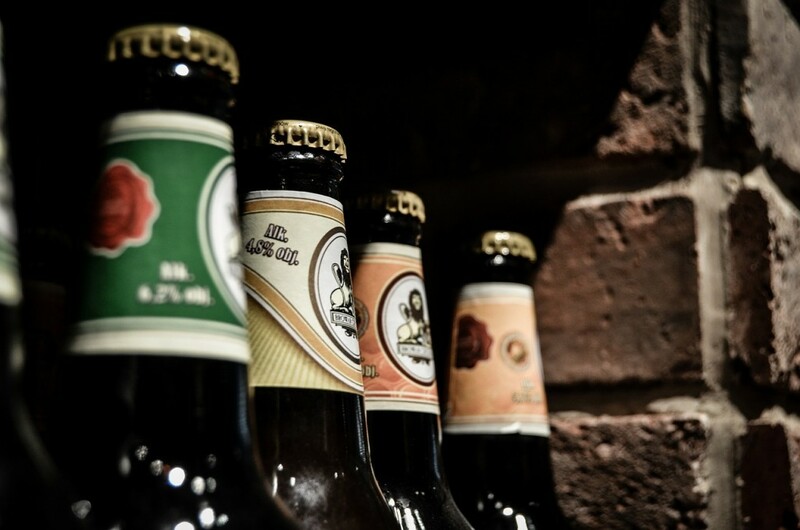 Drop by after dinner in the El Carmen district to try one of the ten craft beers on tap, listen to some chilled out music and mix with a young, international crowd. Try the flagship brew Tyris Original as a perfect introduction before moving on to the famous darker, stronger brews like the black IPA. You can visit the Tyris brewery on Saturdays, where for €9 you can taste every type of beer available. Around the corner from Tyris On Tap and very easy to walk past without noticing at first, from the outside this Old Town haunt looks a bit like a dusty old British pub – which isn’t such a bad thing. Inside, the clientele at The Market are younger and trendier than you might expect, and there’s a welcoming, relaxed atmosphere amid the stout wooden tables and walls decorated with funky art and Hunter S. Thompson quotes. The very friendly staff can help you navigate the selection which usually includes local brews as well as offerings from the likes of BrewDog. In the heart of the old town, not far from the Serrano towers, Beers & Travels is an unusual bar with a slightly odd name. It started life as a travel agency focused on arranging beer tasting trips (dubbed ‘beercations’) around Europe, and has since evolved into a craft beer tasting room with a changing selection from local breweries. If you want to try a bit of everything on offer, the owners can happily arrange a tasting session. For those who prefer to get out into the barrios and find a true characterful haunt, this is your place. Despite being very local, it’s welcoming to travellers wishing to try great beers amid the tasteful interior. They organise tastings and sell a changing selection of local beers, such as the range from local Valencian craft brewery Cervezas Antiga, which also arranges tastings at their brewery near the city on Saturday mornings. The bar is well off the beaten path, tucked away in a residential neighbourhood just a short walk from the historical centre and the Turia riverbed gardens. Make a note of the location before heading out, as it’s one of those places you’d never find if you didn’t already know about it. Visitors arriving in Valencia by rail will be happy to hear that there’s a craft beer bar just a few steps outside of the station in the form of Blue Moon. This shiny, modern, central bar between the town hall square and the Estació del Nord train station is a bit smarter in appearance than others on this list, but it has plenty of interesting beers on tap all under the American Blue Moon label. In fact this is the first (and so far only) bar in Europe selling the brand – which some would describe as “crafty” rather than truly “craft” beer. Try an IPA or Pils with one of Blue Moon’s huge, messy burgers. Despite the central location, prices are no higher than at other craft beer bars and the crowd is a good mix of locals and tourists. This authentic American bar and restaurant brings a love of craft beer all the way from Oregon, USA, where the owner is originally from. Decorated with recycled wood and always showing some kind of sports on the TV screens, Portland Ale House is packed every night with a mix of Valencians and expats who come to enjoy the seasonal selection of craft beers and a food menu including burgers stuffed with jalapeños, plates of nachos and huge slabs of banoffee pie. As well as weekly language exchange and quiz nights, they also host special events such as Super Bowl Sunday and a Thanksgiving dinner for Valencia’s homesick American residents living in and around the very international Ruzafa area. Another favourite in the Ruzafa neighbourhood, you’re bound to find something to suit your tastes at Olhöps Craft Beer House. The bar has a chalkboard bulging with an ever-changing selection of special brews, and the requisite knowledgeable staff are happy to help you make your choice. 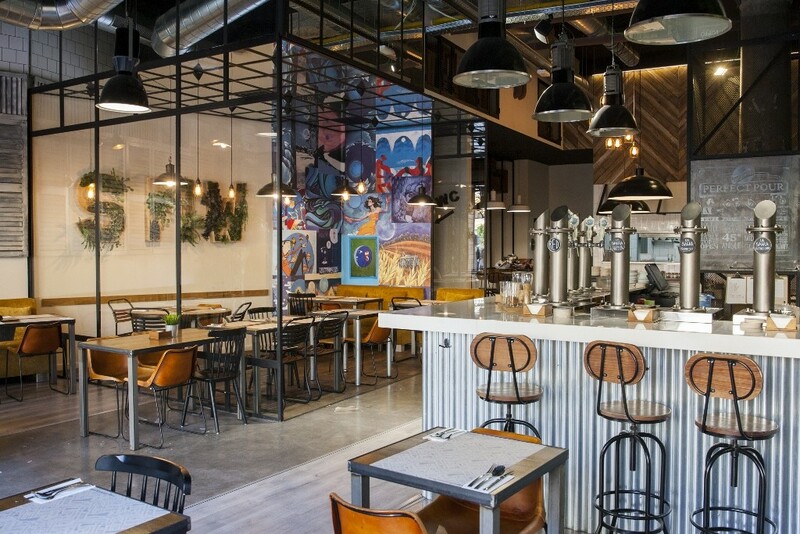 The space is airy and bright, making a change from the usual dark and cosy beer tavern atmosphere and taking advantage of Valencia’s incredible year-round light. They host events throughout the year ranging from jazz concerts to beer pong tournaments, so check out their Facebook page to find out what’s on during your visit.